Summary: The Dakota Alert DCMA-2500 is one of the best driveway alarms on the market. However, I recommend the Guardline GL2000 simply because it has a higher quality motion detector sensor. The Dakota Alert DCMA-2500 features a passive infrared (PIR) sensor that detects people, vehicles and large animals. The alarm kit comes with 1 motion sensor, 1 receiver, 1 transformer, mounting hardware and installation instructions..
For best results, the transmitter should be about three to four feet off the ground, and about twenty feet from the side of the drive. The Dakota Alert DCMA-2500 features a reliable passive infrared (PIR) sensor that detects people, vehicles and large animals. It comes with a lot of useful features, such as flashing LEDs, exit delay and the ability to add more sensors in order to monitor several areas of your property. 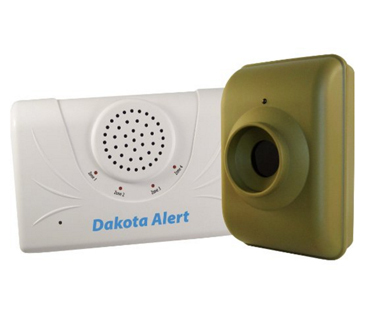 The Dakota Alert DCMA-2500 is a great alarm but I prefer the Guardline GL2000 because it has a better motion sensor.